Kate (left) and Tess Donlevie open a mystery envelope from a travel agent that specializes in mystery trips. 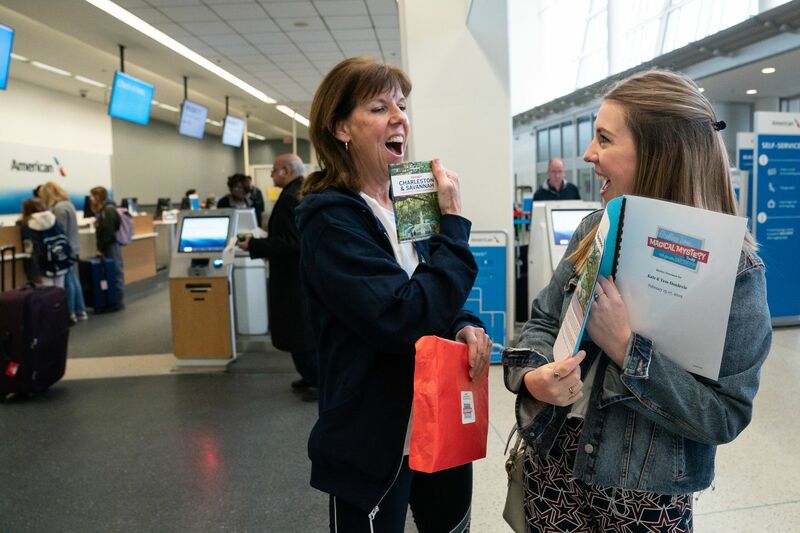 The mother and daughter opened their surprise travel itinerary at the Philadelphia International Airport. Kate Donlevie and her daughter Tess struggled to open the large red envelope that would announce their weekend travel destination. Instructed not to open it until they were in Philadelphia International Airport’s Terminal F, they were anxious with anticipation. “Savannah!” they announced at the same time. They had only planned the Magical Mystery Tours trip about two weeks earlier. “I thought a mystery trip sounded fun,” Kate said. “I hate planning.” After filling out an extensive questionnaire, the tour company did all the legwork. Surprise trips are about adventure while leaving the time-consuming and stressful planning behind. If there isn’t a natural planner in your circle of friends, lots of companies will do the work for you. Clients get a thorough questionnaire to narrow down their likes and dislikes, where they’ve traveled previously and details including whether they like to wake up and get going or linger through a leisurely breakfast. Is their ideal afternoon spent poolside or hiking? Questions cover hobbies, food preferences, distance they are willing to travel, and vital statistics including passport number. And interest in these types of trips is growing. “Ten years ago everybody thought, ‘I have the internet, I can plan a trip,’ whereas now, they think ‘There are a million options on the internet and it’s hard to plan a trip,'” said Denise Chaykun Weaver, president of Magical Mystery Tours in Drexel Hill. Kelley Gorman, 29, is a planner but instead of going with a company like Magical Mystery Tours, she offered to organize the trip herself when her group of five friends decided to go on vacation last November. Each agreed on a $1,300 budget to cover all expenses for their four-day getaway. Trip highlights included a beautiful Airbnb overlooking San Francisco, hikes through Muir Woods and Hawk Hill, exploring Sausalito and hitting great bars and restaurants. Kelley Gorman of Society Hill, Becky Lederer of Northern Liberties, Sarah Parkes of Northern Liberties, Lauren Galetto of Collingswood, and Kerri Elko of Manayunk on their mystery trip. “It was a really memorable and great trip,” said Gorman, who would happily do it again. “If you go in with the right attitude, it’s a good surprise,” said Chaykun Weaver. She started planning covert getaways in 2010. The anticipation is often as fun as the trip itself, she said. About a week before your trip, you’ll get the weather forecast at your destination, what to pack for your trip and when and where you’ll need to be. Travelers get an envelope with their travel documents and itinerary several days before leaving, but are urged not to open it until the last minute. Magical Mystery Tours started serendipitously when Weaver offered to plan a trip for a friend in 2010, and now has five employees and an expected revenue of $1 million in 2019, up from about $300,000 three years ago. Weaver thinks the recent surge comes from exposure of mystery trips through media, social media, and word of mouth. Customized vacations start at $900 for a weekend getaway for one, to tens of thousands for luxury group excursions. The tour company takes $300 for planning, commissions from hotels, and additional fees to set up excursions. The trip Justin Shaffer planned to celebrate his 10th anniversary with his wife, Amanda, last March was a double surprise. Knowing that their vacation preferences don’t always align, he gave Magical Mystery Tours a budget and a list of things the couple both enjoyed, but didn’t tell Amanda. “Not only could somebody plan it for me, but it was also a surprise and I had no hand in the mix because I didn’t even know where we were going,” said Justin, 33. They ended up in St. Lucia, staying at Crystals, tree top villas in a mango tree grove — “not your typical beach resort where a lot of people would flock,” said Amanda, 33. The couple loved the trip and the process, and can’t wait to do it again. Tina Barkers and Philip Gentry from Birmingham, Ala., who came to Philadelphia on a mystery trip. Tina Barkers of Birmingham, Ala., discovered the City of Brotherly Love on her Pack Up + Go Surprise trip in October 2018. An avid traveler, she wanted to celebrate her friend Philip Gentry’s 49th birthday, but decided to leave the planning hassles to someone else. Their $650 per person three-day package included their flights, Sonesta Hotel stay, restaurants and all the highlights — the Rocky statue, a run up the steps of the Philadelphia Museum of Art, visits to the Liberty Bell and Reading Terminal Market, a carriage ride and more. “You have to be open minded to do something like this because you have no control until you actually get there,” she said.